Much Ado About Dickens: Why The Bicentennial Hype Matters He's trending on Twitter, inspiring Google Doodles and hawking hoodies. 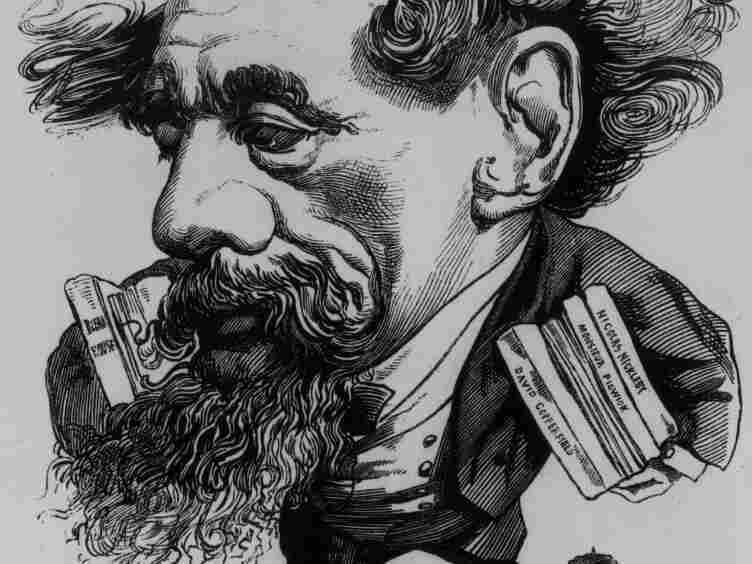 Why Dickens has always inspired such adoration — and why the book business should pay close attention. An Andre Gill caricature of the novelist with his own books under his arm. If you are a book lover with an unquenchable taste for kitschy Victoriana, good news: this week, the world has finally caught up with your interests. The occasion: the bicentennial of Charles Dickens's birth on February 7, 2012. In the United Kingdom, the United States, and in countries around the globe, the event is being celebrated with some of the seriousness you'd expect — with readings, exhibitions and special issues of journals (e.g. the Cahiers victoriens et edouardiens, which gravely announced its editors' intention "to assess the Inimitable's presence in our times"). But it is also bringing giddier pleasures. Starting Tuesday, you could download a new Celebrating Dickens app for your smartphone and click on a cartoonish Google Doodle; by Tuesday night, you could track "Charles Dickens" as it trended on Twitter, along with "Ricky Martin" and "#10sexiestmales." In San Mateo, a Charles Dickens Bicentennial Ball featured quadrille dancing and "a light Olde English snack buffet"; across the country in Lowell, Mass., a museum hosted a Dickens-themed "Steampunk Soirée." ("How do steampunks dance?" a friend wondered.) Then there's the merch: in addition to any of a host of new books about the man, you can also buy a Dickens bicentenary hoodie, ringer T-shirt or bag in which to tote your Oliver Twist. So profuse are the events and products and publications that it takes a few moments to grasp that a Daily Mail listing for a noontime yodeling of key passages from "A Christmas Carol" is likely in jest. As that sly announcement suggests, some observers do feel that the anniversary hype has gotten out of hand. British writer and critic Jenny Diski was sick of the thing practically before it began: "By two o'clock on New Year's Day in this Dickens bicentennial year, I already found myself wishing that either he or I had never been born," she wrote with endearing crankiness in the Guardian last month. And there is something to this. In addition to being famous for being famous, like some Real Housewife of the Nineteenth Century, didn't Dickens write a few novels? Upon his death in 1870, crowds mourned this literary icon as if they'd known him; as Longfellow wrote, "It is no exaggeration to say that this whole country is stricken with grief." And the first centennial of Dickens's birth was marked with no less fanfare (or commercialism) than the second. Though smartphone apps and hoodies were in shorter supply, 1912 fans could purchase commemorative Dickens centenary stamps or jigsaw puzzles depicting Dickens stagecoach scenes—the moment when David Copperfield arrives in London, say. There were starry performances, some which doubled as fundraisers for Dickens's impoverished family. One packed Carnegie Hall tribute on Feb. 7, 1912, featured readings of letters in praise of Dickens by Winston Churchill and Henry Cabot Lodge, as well as recitations from the novels. As a climactic chapter from Little Dorrit was read aloud, women wept, the New York Times reported. "The crying went on as uninterruptedly as the reading until the chapter was finished, and then the crying women dried their eyes and applauded, and the men cheered." But let's say you're impatient with all the cheering and dancing and crying, with the trinkets and parties. Say you just want people to read Dickens's work. This might still be the most effective way to make them suddenly decide to do so. As the number of books released every year continues to swell, and the publishing industry considers how the heck to attract a large audience to any particular title, the passionate, word-of-mouth publicity campaign has become a holy grail. I can think of only one living author capable of inspiring a collective global audience to stay up, put on costumes and talk excitedly about fictional characters: J.K. Rowling, a writer who is definitely not having a problem with readership. If, two centuries after his birth, Dickens can still inspire that kind of frenzy, the pro-reading lobby has no reason to do anything but celebrate. Still, notably, some of the best public tributes to Dickens have been the ones closely bound up with the novels themselves. I've particularly enjoyed Radhika Jones's day-by-day countdown of her top ten Dickens novels on the Time.com website, for instance, revealing enough of the plots both to delight those who know the books and to intrigue those who haven't yet dived in. These confiding, informal accounts make you want to curl up and read, or reread, the books. Maybe the Google Doodle will nudge someone to read a Dickens novel, too. But another recent technological development is even more likely to make that happen: these books are now free. They are not just in the public domain and thus available in dozens of cheap paperback editions (though you may prefer these gorgeous Penguin Classics hardcovers); not just a guaranteed presence in the collection of your local library; but also freely available electronically. These days, you don't have to buy a ticket to Carnegie Hall or even a book: you can just download one of these novels onto your phone and start on page 1. This strikes me as an incredible gift. Amid all the mourning for our distracted, degraded cultural life, never as good as it used to be, a week where everyone reminds each other to read Dickens, for free? Sign me up. I may not have made it to the steampunk ball (although I hope you did and will tell me all about it), but I did happily spend the evening with a paperback copy of Bleak House — and for the inspiration to do so, I'd like to thank the Dickens hype machine.